Build a Garden Bench From Two Old Dining Chairs | DIY projects for everyone! From a seating furniture to another seating furniture! All you need is two chairs, and just by looking at it we’re sure you’ve already figured out how to turn them into a bench! If the chairs are starting to wobble, all you have to do is attach some reinforcements — just like in the picture shown above. And if your chairs are wooden, you can choose to maintain it’s old rustic look or you can repaint them with a bright colour. Both are good choices, it’s just a matter of taste! 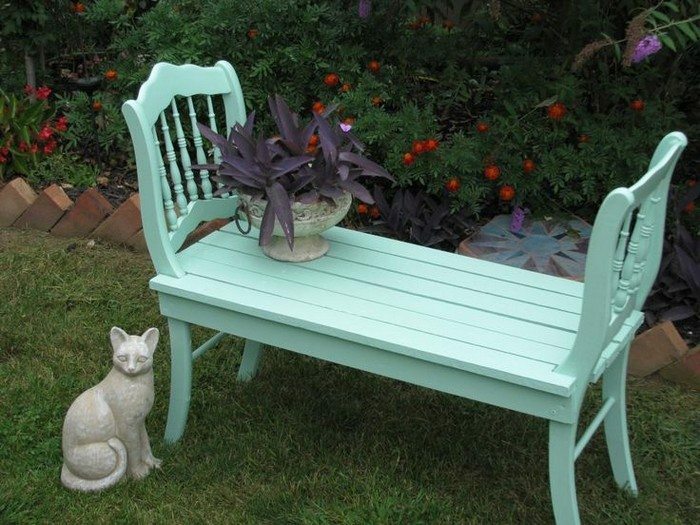 This DIY bench is perfect for gardens or any other outdoor areas. With its creative and unique features, it’s impossible not to get noticed by anyone looking at your yard. Got three or more chairs? You can use them all to create a single bench. Or why not create two garden benches? View the album below to know the different versions of this creative idea and see the link to the tutorial! Inspired to make your own garden bench?